Take a look at your content marketing strategy. Your business may have blog posts to write, tweets to schedule, and emails to send out to new subscribers. The world of content marketing can include a long list of media and channels that help you reach potential customers, leads, and loyal buyers. Is podcasting in your list? If you are looking to expand your content marketing strategy and take advantage of the latest trend in producing and distributing content to loyal consumers before your competitors do, it’s time to get behind the microphone. The first files similar to podcasts were recorded in the 1990s, but podcasts didn’t take off until 2005 when Apple added podcasts to iTunes. Content marketers and industry experts have always acknowledged the potential of podcasts, but it wasn’t until recently that podcasts have boomed. Between 2015 and 2016, podcast listening grew 23%, and the growth has only continued since. The rise of podcasting complements the rise in mobile and is continued by the rise in influencers, experts, and marketers hopping on the podcast trend. Where Are Podcasts in Content Marketing? Podcasts aren’t just for comedians or people who enjoy niche subjects. Content marketers can take advantage of this platform to establish trust in brands, build up clients as authorities, and advertise their products. While podcasts aren’t as high of a priority as blog posts or social media, 11% of marketers have reported that they plan on using podcasts in their content strategy in the next year. These marketers have the whole world at their fingertips, but even if they want to focus in on listeners in New Zealand or Australia, they can reach a wide audience. Three out of ten Australians have claimed to have listened to a podcast, but this number is growing every year. New Zealand isn’t too far behind, and we can expect to see numbers rising steadily over the next few years. The current growth of podcasts is exciting for listeners around the globe, but this is only just the beginning of the podcast boom. Google’s efforts to bring podcasts into everyone’s home could be the final push to make podcasting a top medium for storytellers, businesses, and content marketers alike. If you’re not paying attention, you might be surprised to see the presence of podcasts on your Google search results and across your mobile device. Why? Google is working hard to bring podcasts into the spotlight. Google Podcast Product Manager has said, “Our team’s mission is to help double the amount of podcast listening in the world over the next couple years.” How are they going to do it? They’re recruiting search engine optimisation to bring podcasts to the top of your search results. Google Podcasts is working to optimise each podcast show and episode so it is recognised by Google Search and Google Assistant. In the future, when users are searching for questions or subject matter, Google will show related podcast shows and episodes. Podcasts may already show up on your search results, but Google Podcasts wants to make podcasts a “first-class citizen” alongside blog posts, landing pages, video, and images. Seeing podcasts on the first page of results will eventually be the norm, and users can also find their favorite podcasts with voice commands. Google also plans to make the podcasting experience easier for Android customers, and plans to tap into an audience of Android users who are less likely to be listening to podcasts on their mobile devices currently. Currently, podcast users consist mainly of iOS customers who can access podcasts with a few clicks. Google has been pushing podcasts since its boom in 2016 when they added podcasts to Google Play Music. Google’s approval and encouragement is a big signal for businesses to jump on the podcasting train now. You can reach consumers where your competitors aren’t. Podcasts aren’t the hottest channel for content marketers or businesses, so it’s a great opportunity to reach an audience before anyone else. This medium also allows you to reach consumers when your competitors who are sticking to other channels. When your consumers are cleaning their house or driving to work, they don’t have the time or attention span to read blog posts or watch videos. They do, however, have the capacity to listen to a podcast. If you can provide engaging content and good stories for listeners, they will stick with your podcast (and your business) throughout their day. Podcast listeners show you who your loyal audience is. Loyal: When podcast listeners tune in, they are ready for the long haul. Only three percent of podcast listeners report stopping a podcast after the beginning; 42% listen to an entire episode, advertisements and all. Loyal listeners are also more likely to follow the podcast and related brands on social media channels. Affluent: 16% of podcast listeners make over $150,000 a year. 63% of podcast listeners have full-time employment, which is slightly higher than the general population. Educated: Three out of ten podcast listeners have an advanced university degree. More engaged online: In addition to spending an average of — hours listening to podcasts, podcast users tend to spend more time on social media than the general population. Podcast listeners more frequently have subscriptions to video on-demand services, and are more aware of smart speakers like Alexa and Google Home. This audience provides a unique opportunity to really dig into the details of your industry and have lead important conversations with innovators. If you can host a platform to interview experts in your field, you can boost your reputation with your – and your guests’ – followings. Podcasting creates even more content for your newsletter, social media, etc. If you have created your content strategy, you know the more channels you write content for, the better. Podcasts allow you to condense and transfer content to a variety of different channels without creating something new. The rise of podcasts opens a lot of opportunities for creativity and new ideas, so get your current team together and have a big brainstorming session. CTAs get stuck in listeners’ heads. It’s easy to skim past a CTA button on a landing page, especially if you have seen it across multiple pages on a website. An aural call to action, however, is more likely to stick with you. Think of commercial jingles, or even spoken ad copy, that you can repeat ten years after it has aired. If you include a clear, consistent call to action at the beginning or end of your podcast, your suggestion will be remembered by your podcast listeners. …Above all, starting a podcast is cheap. A professional microphone and editing software are minor expenses when you consider the amount of new content you can produce and the wider audience that you can reach. All you need to do is write a script, reach out to possible guests (which may include members of your current team,) and start recording! Podcasts can be funded by your own efforts or by advertising partnering companies. After listeners enjoy your podcast, where will you send them for further engagement? How can you use this content on other channels? Which segment of your audience is most likely to listen, and how can you tailor this content for them? These basic questions are just the beginning of what shapes your podcasting content. Before you write your script, consider where your listeners fall on the buyer’s journey, and what you can do to encourage them to become a lead or even a customer. Think of what your content and podcast will need to bring your business success in generating leads, encouraging loyal support, or any other growth goal that you may have this year. 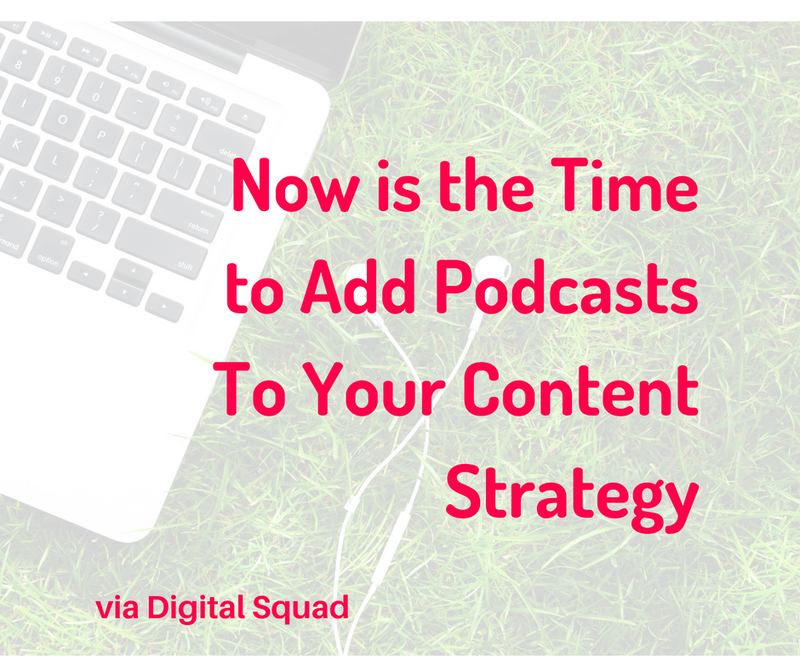 Before you start podcasting, you will have to have a content marketing strategy in place that considers different target audiences and where you can reach them online. Want to learn more about how creating a content marketing strategy can help your business generate more leads and boost conversion rates? Reach out to the experts. The team at Digital Squad can help you analyse your current buyers, research the buyers you want to reach, and show you how to create a comprehensive content marketing strategy that helps you meet your goals. Learn more about why Digital Squad is one of the top content marketing agencies in Auckland.